The other iconic way to move from one place to another is by Tricycle or Trike. A motorbike with a sidecar attached to it. It’s for short travels and a bit more expensive per ride than a jeepney, but it will drop you off at the place you want to go. Usually costs between 10 to 200 Pesos, depending on distance. If you go far, first negotiate a price. Short distances are generally 10 or a bit more. 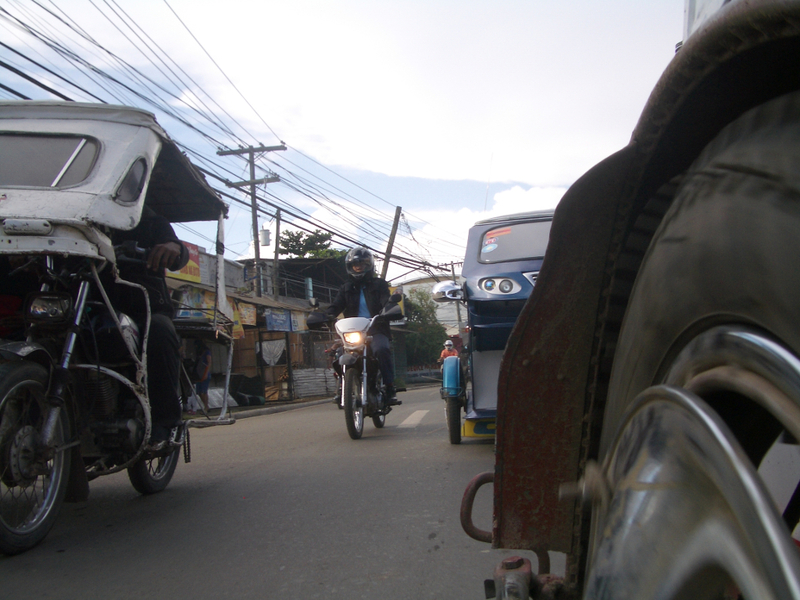 Using a jeepney as a medium distance bus service (one or two hours or so) between smaller towns is very easy though. All jeepneys have their itinerary written on the side of the vehicle, which is very clear when it goes from town A to town B. As said before, in Manila it is much harder, because the ride goes from a for the traveller unknown street A to unknown street B or C, etc.. (of course, when you live there longer, you might know what streets it will pass!). Both modes of transportation are quite okay in more rural areas or relatively quiet and not heavily congested towns and cities. For Manila I just don’t know what is the ‘best’ way to get from A to B. Traffic seems not to move between seven in the morning and ten in the evening. One big traffic jam. The annoying thing is that walking in the smoggy environment isn’t very pleasant either. ← Travel South East Asia: what to bring?